Because two cameras and four lenses just isn’t enough for one day, Fujifilm has added yet another camera to its X Series, this time a premium compact with 24.3MP sensor. The X100F’s spec sheet also thrown a new processor and Advanced Hybrid Viewfinder into the mix, not to mention a fixed 23mm f/2 lens (35mm equivalent) and a raft of other creatives features and modes that more than match its interchangeable lens brethren. Fujifilm today announces the launch of the latest premium compact digital camera – the Fujfilm X100F in February 2017. In February 2013, the second-generation model in the series, Fujifilm X100S, was released with a newly-developed sensor and image processing engine.The company updated the series in September 2014 with the launch of the Fujifilm X100T, boasting the use of the world’s first electronic rangefinder function, in an effort to constantly lead the segment of premium compact digital cameras with cutting-edge technologies. The X100F features the 24.3MP X-Trans CMOS III, an APS-C sensor with no low-pass filter boasting the highest performance in the history of the X Series, as well as the X-Processor Pro high-speed image processing engine to deliver outstanding colour reproduction and gradation of tones in both stills and videos with high ISO sensitivity and low noise. The Film Simulation modes, developed with Fujifilm's philosophy of colour reproduction nurtured in over 80 years of photo film research, have further evolved to capture a subject's textures, three-dimensional feel and even the atmosphere surrounding it. Basic response specifications have been enhanced to the extreme in the X100F. A start-up time of approx. 0.5 seconds, shooting interval of 0.2 seconds, shutter release time lag of 0.01 seconds and fastest AF of 0.08 seconds, ensure the camera operates exactly as the photographer intends. 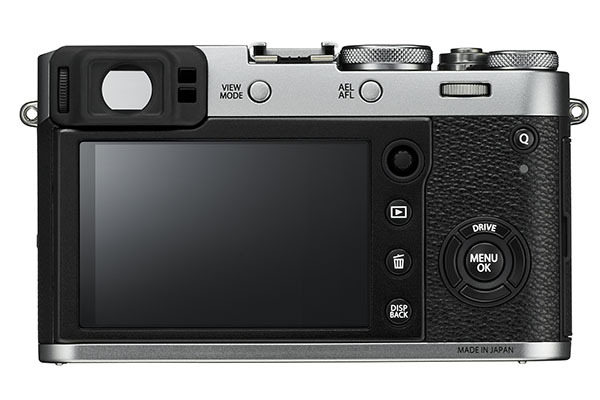 ・ New features in the X100F include the Built-In ISO Dial, incorporated into the Shutter Speed Dial reminiscent of film cameras of yesteryear, the Focus Lever, which allows you to instantaneously move the focus area without having to take your eye off the viewfinder, and the “C” position for enabling ±5 stop exposure compensation. Most of the operation-related buttons and dials are concentrated on the right-hand side to allow quick change of settings while firmly holding the camera. ・ The X100F features Fujifilm's 24.3MP X-Trans CMOS III APS-C sensor. Its highly random pixel array effectively reduces moiré and false colours without the use of an optical low-pass filter. The elimination of the low pass filter, which is attributed to loss of image resolution, makes it possible to draw out Fujinon lenses' true capabilities to the maximum extent. Coupled with the high-speed image processing engine “X-Processor Pro,” the X100F produces image quality comparable to that of cameras equipped with a larger sensor with higher pixel count. ・ The Film Simulation function now features the Acros mode. Using X-Processor Pro's advanced processing capability, the mode offers smooth gradation, deep blacks and beautiful textures to create monochrome images that far outperform the previous Monochrome mode. ・ The X100F also has the Grain Effect function for reproducing distinctive graininess seen in photographs taken with film cameras. The function is available in “Strong” and “Weak,” and can be combined with any of the Film Simulation modes. You can easily obtain the effect of film-based photos, notable especially when the image is printed out. ・ Despite having the pixel count 1.5 times that of the X100T, the new device and its enhanced signal processing technology have successfully controlled digital noise even further. Improved ISO sensitivity means ISO 12800, which was part of extended ISOs in the X100T, is now available as a regular ISO option. Even at ultra-high ISO settings, the camera produces low-noise images, reproducing deep blacks and smooth gradation of tones, capturing beautiful images even in low light conditions. ・ Basic response specifications have been enhanced to the extreme in the X100F. A startup time of approx. 0.5seconds, shooting interval of 0.2 seconds and shutter release time lag of 0.01 seconds, ensure the camera operates exactly as the photographer intends. ・ The number of focusing points has been dramatically expanded from 49 in previous models to 91 (up to 325 points). Approx. 40% of the imaging area (center area containing 49 focusing points) is covered with phase detection AF pixels to form a fast and precise phase detection AF area that can be used in a variety of scenes. ・ The X100F has an enhanced ability to autofocus on points of light, low-contrast objects and subjects with fine and delicate textures such as bird feathers and animal fur, which have been the weakness of phase detection AF. ・ The performance of contrast detection AF, covering approx. 85% of the imaging area, has also been improved. The data read speed has been doubled compared to previous models to achieve AF performance of higher speed and precision. Accurate focusing is obtained even at the low light condition of -3EV. ・ The X100F offers AF-S for stationary subjects and AF-C for moving subjects. For both of these options, you can choose either “Single Point” or “Zone” mode for the type of focus area, as well as the “Wide / Tracking” mode, in which the camera automatically selects multiple areas for focusing. In the Single Point and Zone modes, use the Focus Lever beside the LCD monitor to instantaneously change the location and size of focus areas. ・The lens is made up of 8 glass elements in 6 groups, which includes one high-performance double-sided aspheric lens and a convex lens made of high refractive glass. Images display minimal aberrations, along with high sharpness, and beautiful colour reproduction. Fujinon's unique HT-EBC coating is applied to the lens control flare and ghosting. ・ Manual exposure can also be set during movie shooting. Aperture, shutter speed and ISO sensitivity can be changed enabling movies to be shot using an exposure of the user's preference. The X100F will be available from 16th February 2017 in black and silver with an RRP of £1249.00. 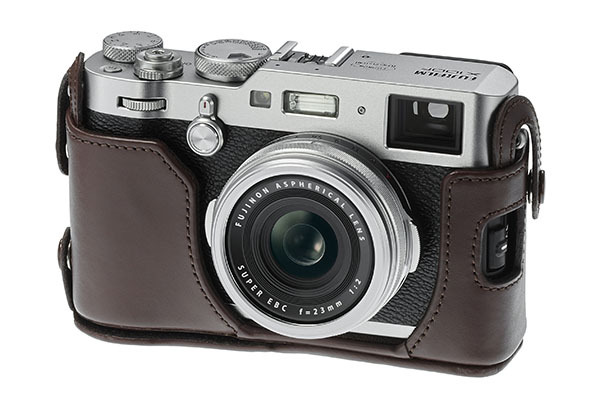 Read full reviews of the Fujifilm X100S and Fujifilm X100T mirrorless cameras.